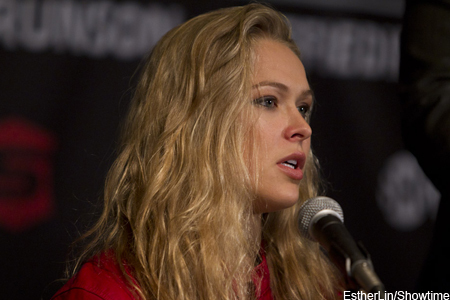 The Ronda Rousey (Pictured) hoopla train officially leaves the station on Thursday night. In anticipation of the “Rowdy” one’s big league debut, FUEL TV will premiere the first episode of “UFC 157 Primetime: Rousey vs. Carmouche” tonight at midnight ET (9PM PT satellite). FOX Sports Network also airs the debut tonight at 6PM ET. The last two installments of the three-part series will hit the airwaves on FUEL TV the subsequent Thursdays leading up to her February 23rd shootout with Liz Carmouche. The documentary follows the ladies through their final weeks of training camp. UFC 157 takes place inside Honda Center in Anaheim, California. The 135-pound scrap headlines the pay-per-view broadcast.